Hi, I am interested in your 1935 Ford Other Ford Models (stock #1300-NSH) listed on Autotrader for $38,995. I'd like to get more information about this vehicle and confirm its availability. 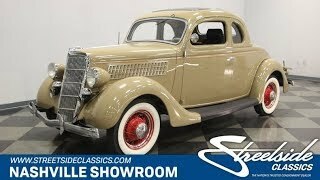 If you are a fan of 1930s styling, but not really of the highly modified street rods that they are frequently turned into, then take a good look at this nice 35 5-Window Coupe. It keeps the charming character of the original car and adds just a couple updates for your comfort and convenience. Check it out. The 1930s was a wonderful time for the automotive styling departments. In the early years, Art Deco influences generated geometric and stylized designs. By 1935 streamlining had become the trend and this car is a wonderful example of that. The long piano hinged hood tapers toward the front leading to a tall, upright chrome grill that flares back from the center and is topped by a classic V8 hood ornament. Sculpted fenders start low on the hood flowing up and over the wheels with teardrop headlights and horns mounted in the valley between them. A stylized chrome bumper beautifully underlines everything. The sides of the hood have vents to let hot air out with thin slashes of chrome accenting them. A red pinstripe runs front to rear along the top and running boards connect the fenders along the bottom. The back flows gently down over the rumble seat (which is where everyone wants to ride!) to the externally mounted spare which is underlined by another sharp looking bumper. Open the door and you will find a simple and clean Tan interior with a couple nice upgrades. The biggest change, and one that makes this car suitable for long distance cruising, is the comfortable and supportive Procar bucket seats dressed in black. Also, a modern steering wheel wrapped in leather is mounted on a tilt column and feels good in your hands. The owner of this car has the original seats and steering wheel available if you would want them. The dash is neat and clean with the speedo in the center with engine gauges to each side and there is an auxiliary oil pressure gauge to keeps accurate track of that function mounted underneath. Ivory control knobs flank a chrome waterfall accent with a V8 badge in the center and the shifter for the manual transmission rises from the floor. Speakers mounted behind the seats pump out the sound from a Kenwood AM/FM/CD player for your listening pleasure. Open up that piano hinged hood and you will find a stock 239 cubic inch Flathead V8 motor tucked down in a neat and clean engine bay. A tall air filter assembly sits on top of the single barrel carburetor, and yes, they were using aluminum for intake manifolds even back then. This car has been updated with a 12-volt electrical system for easier starting and reliability, and signs of good maintenance include ignition components that are in good condition as well as fresh belts and hoses. Power flows back through that 3-speed transmission to the rear axle located by long trailing arms and a single transverse leaf spring. A single leaf is also used up front along with a solid axle. The rubber meets the road through 6.00-16 wide white wall tires mounted on red wire wheels with chrome V8 caps and beauty rings. This is a charming and stylish 1930s car that remains very true to the original, but with a couple updates that make it easier and more pleasurable to drive on a more regular basis. Come on down and take a look. You just might decide to drive it on home.